I found the store assistant we asked for help to be surly, unhelpful and to be honest useless... I later found out that she was in fact the manager!!!!!!!!!!!!!!!!!!!!!!!!!!! Although the store only had a couple of customers and we were the only ones actively looking for assistance we had to hunt out help. surely the staff and their managers are there to serve customers not just stand around !! When we did ask for help we weren't treated in a pleasant way in fact we felt as if we weren't wanted at all. We ended up buying 3 pairs of shoes but the whole shopping experience was NOT a pleasant one. I found the store assistant we asked for help to be surly, unhelpful and to be honest useless... I later found out that she was in fact the manager!!!!!!!!!!!!!!!!!!!!!!!!!!! Although the store only had a couple of customers and we were the only ones actively looking for assistance we had to hunt out help. surely the staff and their managers are there to serve customers not just stand around !! When wedid ask for help we weren't treated in a pleasant way in fact we felt as if we weren't wanted at all. We ended up buying 3 pairs of shoes but the whole shopping experience was NOT a pleasant one. 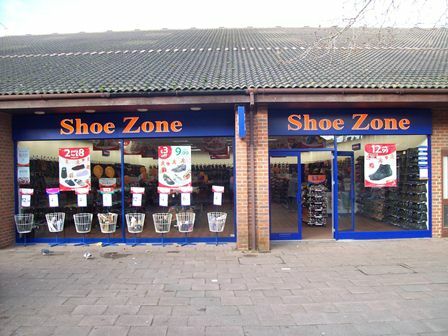 visited this store today wanted some nice comfortable black sandals and I was spoilt for choice so many to choose from and at such reasonable prices too didn't take me long to find a pair just right for me with help of the very pleasant assistants working there the store is very clean and tidy making it very easy to see all of the different styles of shoes on display will definitely be going back .